Every year around this time I’m mesmerized by the beautiful planners whose floral patterns and crisp lines so elegantly grace my newsfeed. Last year, I spent way more than I should have on a planner that I only used for a couple months. Fortunately, I have implemented a much better system as I show you how to use Evernote as a planner to set goals and achieve them. When my previous planner found it’s new home on our bookshelf with all the other planners from the last several years, I knew I needed a better system in place. As I mentioned in my post How to Make New Year’s Resolutions Stick, I believe several factors lead to the downfall of my fancy (but pricey) planners. 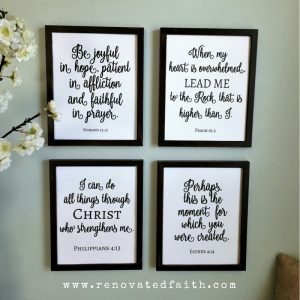 Thinking back over what worked and what didn’t, I realized I was most organized when I was working full time at a church before I had my daughter. I had LOTS of new ministry ideas that had to be implemented in a timely manner, without loose ends attached. Certain it would help me organize and execute all the ideas floating around in my head, I knew Evernote was the answer to this ongoing dilemma as a detail-oriented creative. It was then I realized that Evernote had been my best tool for keeping my life organized! After re-implementing my strategy, I’ve finally found a streamlined system using this free goal planning checklist to maintain a weekly schedule while also achieving my goals consistently! Before you get started, download your free goal planning Evernote template HERE. There’s a principle called Parkinson’s Law that says that work expands to the availability of it’s completion. In other words, if you have 3 weeks to finish a work project but it only really takes you two weeks, you will unintentionally find ways to stretch out the work to three weeks. That’s why having a system in place for setting goals and achieving them is so important so we don’t waste time that can be put towards the next task on our to-do list. One of the best aspects of Evernote is that it is free! 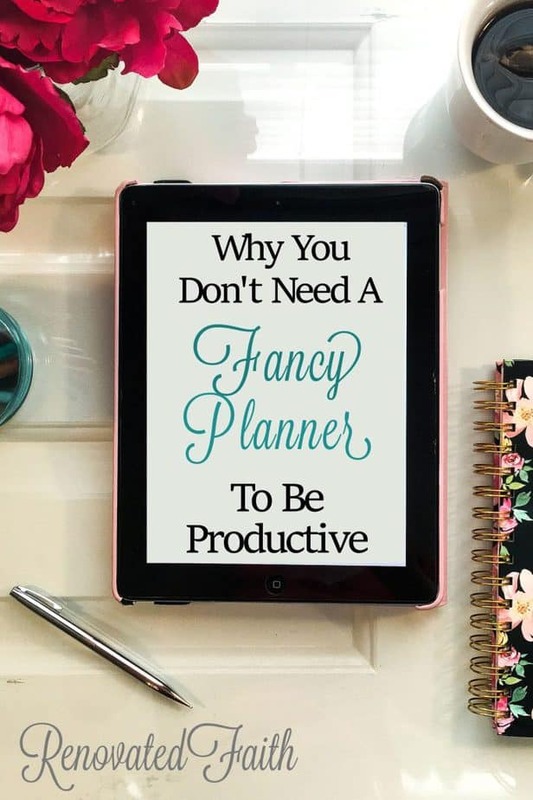 On top of that, it allows me to keep my planner on my computer and a synced version on my phone at all times – no more lugging around a bulky planner in my purse! 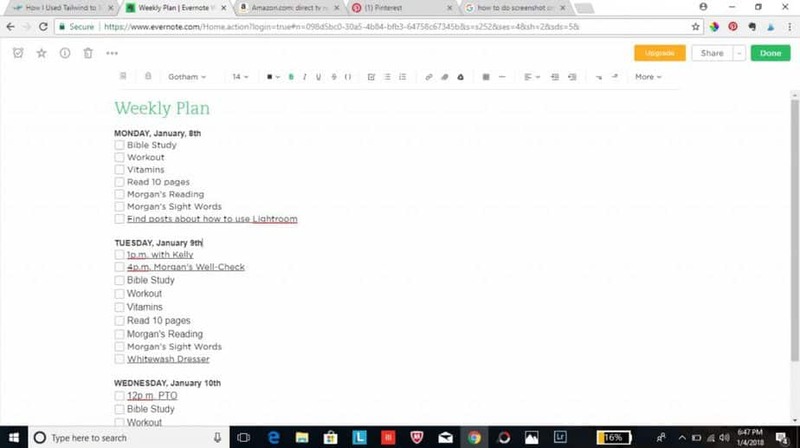 Also, unlike a traditional planner, Evernote is completely customizable for your scheduling needs while allowing you plenty of room to “write”. 1. Get Familiar with Evernote. First things first. Go to www.evernote.com and sign up for the free version. You might want to watch this basic tutorial as you get familiar with the program. Think of Evernote as a bookshelf full of notebooks. Each notebook is some aspect of your life which contains unlimited notes. I created a notebook entitled “Karin” (don’t you love my creativity) for the notebook that contains my most-used “go-to” files. So create a notebook and then tap the plus sign to create your first note. Make three separate notes with the following names: Running To Do List, Weekly Tasks, and Reoccurring Weekly Schedule. There are two types of tasks – reoccurring tasks and one-time tasks. Unlike a traditional planner, Evernote can account for both without you having to rewrite all these tasks every day, week or month. Here is a sample reoccurring schedule. It goes from Monday to Sunday, listing only the items that must be done every day and every week (in other words no one-time tasks or appointments). In this note, take some time to make your weekly schedule that only includes the repeating tasks for your week. 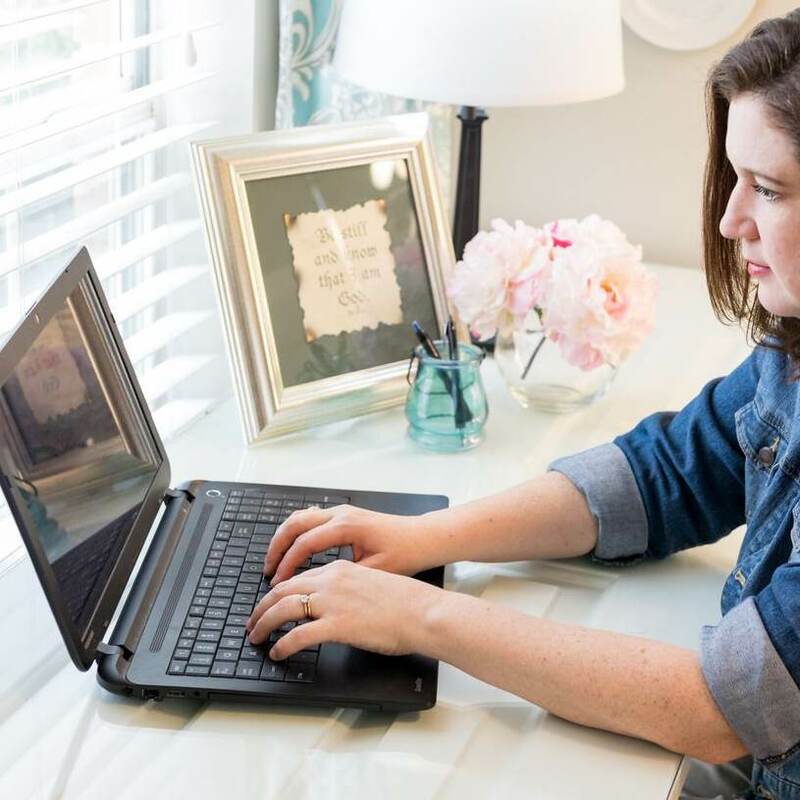 Extra Tip: At the end of my Reoccurring Weekly Schedule Note – I’ll list monthly tasks that must be repeated so that I can make sure to revisit those items every month. Your Weekly Tasks note is your real-time schedule for the week. To make the Weekly Tasks note, you will simply copy and past your Reoccurring Weekly Schedule into your Weekly Tasks note. 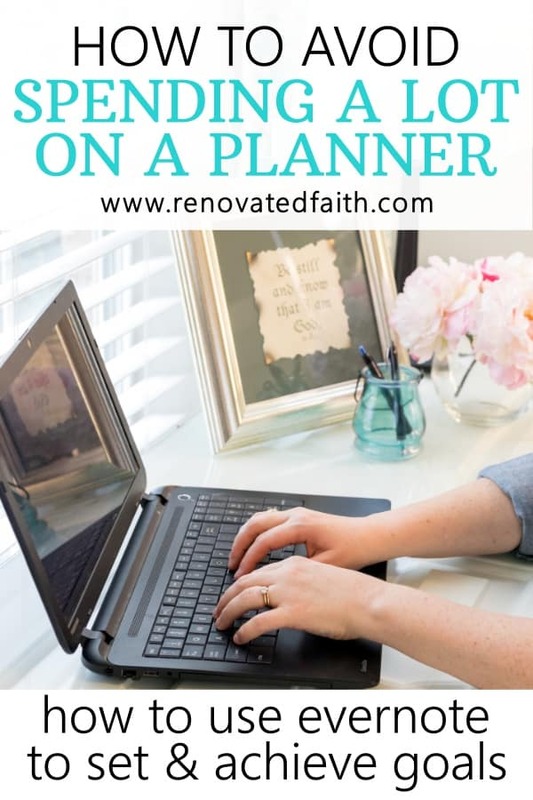 Once you have done that, you will add in any one-time tasks from your calendar (I use this Free Printable Calendar or you can use Google Calendar). Notice that I have added in appointments from my calendar. See where you lost time during the previous week. Identify ways you might need to follow up from last week. For example, you might need to send a thank you note. Build your new week through the next Sunday. Do this by copying your Reoccurring Weekly Schedule and adding in one-time tasks or appointments from your calendar. You could even customize Evernote’s Weekly Review Template. 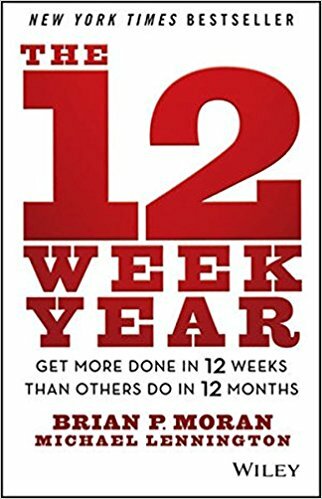 Recently I read the book The 12 Week Year – Get More Done in 12 Weeks Than Others Do In One Year by Brian Moran. In it, he details a strategy for setting goals and successfully achieving them. I’ve taken several stabs at goal planning and this strategy is a complete game changer! It has revolutionized the way I think about goals and the importance of execution. In his book, Moran explains that we often set too many goals over too long a period. He shows that we are much more productive when we set fewer goals over shorter time frame. To accomplish this mindset, he looks at every 12 weeks as a year and in this time one works towards one to three goals. This is different from quarterly planning because the beauty of this plan is that 12 weeks is like a full year. Therefore, if you have a tough 12 Week Year, you can just go onto the next knowing that every 12 weeks is like a fresh start – a new year! The book focuses a lot on execution by showing that execution is the single greatest market differential in knowing how to set big goals and achieve them. Successful individuals and great corporations that produce consistently more than their competitors have one core difference – they focus on consistent execution. This concept really resonated with me because so often I find myself caught up in my own cloud of ideas like a deer in the headlights. I too easily get overwhelmed with information and tasks which leave me unproductive but still worn out. I realized I wasn’t executing what I had already learned. Courses, books and brainstorming sessions are great but how many times do we have God-given goals and ideas that we have yet to execute. To help facilitate the concepts in the book 12 Week Year, I’ve created a free template that you can save into your Evernote account. CLICK HERE to subscribe and access my Setting Goals Worksheet (Evernote Template) and other free printables. If you are subscribed to the blog, you can find it HERE. Just use the password at the bottom of your last weekly newsletter. Goal Planning In Action Using Your Free Template! Once you define your goals, write them in the boxes in the top of your template. Here’s a great article about how to articulate your goals while making them clear, actionable and attainable. Without a vision, there is no execution. Creating a vision is half the battle and it will be the driving force in achieving your goals. On your tough days, look at your vision statement to remember the reason you are pursuing your goals. This is the fun part! Decide how you can go about achieving your goal and add the list to your worksheet. Once your worksheet is filled out, you want to transfer these steps to your calendar. So, every Friday when you do your “Week in Review” you will add these action steps from your calendar to your “Weekly Tasks”. For your calendar you can use the template link below which includes the best Evernote templates for this year. I can’t recommend this book enough and the Free 12-Week Plan Template gives you an outline to help put the strategy in practice! 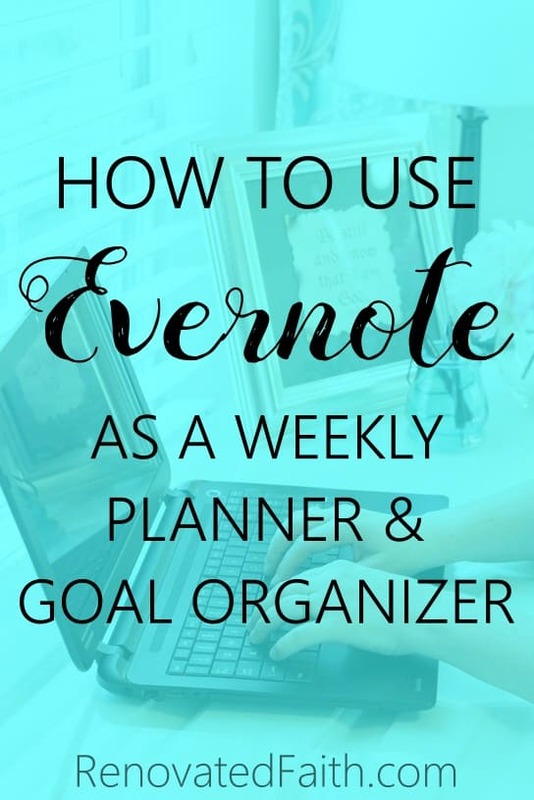 I hope this overall plan using Evernote proves helpful so you never have to buy another expensive planner again! Feel free to ask me questions in the comment section! Excellent post, Karin! Lovin’ it. I devised my own planner for my binder and I like it but I think I’d like to check out Evernote that you use. Sounds interesting and you seem to have a good set up going. Thanks for sharing the details. Thank you so much Cindy! That’s a big compliment coming from you. Wow, I love this. I’ve never thought to use Evernote in this way, in fact, I often feel like I don’t know what in the world to do with my Evernote app. I also didn’t realize you can use Evernote on a computer, not just my phone app. My mind is blown! Thank you so much for sharing your process and experience! Evernote is my new BFF. It’s basically where I put all my notes and information I want to save for later and I can easily search for it when I need it. Also, there is an app on iPhone that allows you to scan straight to evernote. SO, if I have a handwritten list or just something I want to send to Evernote, I take a pic in the Scannable app and it is automatically in Evernote! So glad you liked the post Nicole and thank you for stopping by!